The familiar story is often repeated in cities across the U.S: Following a trip to Disneyland, a local entrepreneur is inspired to create a similar theme park in his or her hometown. Some, such as Six Flags Over Texas, thrived and became multi-million dollar enterprises. Others, such as New York’s Freedomland succumbed in just a few years, while parks like Arizona’s Legend City suffered financial difficulties and struggled for decades. In San Jose, California, local entrepreneur Joe Zukin, was motivated to build a Wild West theme park for the local region. After rounding up financial backers he purchased a 33-acre parcel of the former 600-acre Hayes estate in south San Jose. Construction began in 1960, and with an investment of $3 million, Frontier Village opened to the public on November 4, 1961. Encroaching subdivisions and changing economic conditions forced the park to close in 1980, but those who visited or worked there still have fond memories of the park. Those memories can be relived in Frontier Village, a new Arcadia Images of America book — part of an immense series that commemorates a town, region, or attraction with vintage photographs captioned to tell a story. This book, written by Bob Johnson, is divided into eight chapters. Chapter one tells the story of the opening of the Village and chapter eight tells of the efforts to keep the park open after nearly two decades of successful operation. The remaining chapters highlight a specific feature of the park such as rides and attractions, costumed characters and the actors used in the gunfight shows. Groundbreaking took place on August 1, 1960. The tract of land purchased from the Hayes estate was forested with native oak trees supplemented with exotic species such as pepper trees, cypresses, palms and cedars that had been collected over the years. Founder Joe Zukin hired movie set designer Laurie Hollins to design the park. The layout was carefully planned to fit into the existing landscape, requiring the removal of only four trees during construction. The Frontier Village Main Street was built to resemble the 1890s Old West. Many of the buildings had two stories with the upper floor used for office space for the park staff. In addition to the obligatory Silver Dollar Saloon, visitors would find a General Store, Marshal’s Office, Arcade, Bank, Village Glass Shop and Glass Blowing Shoppe. The General Store carried souvenirs while other buildings housed eateries and shops. The Marshal’s Office had an actual jail cell that children could explore. 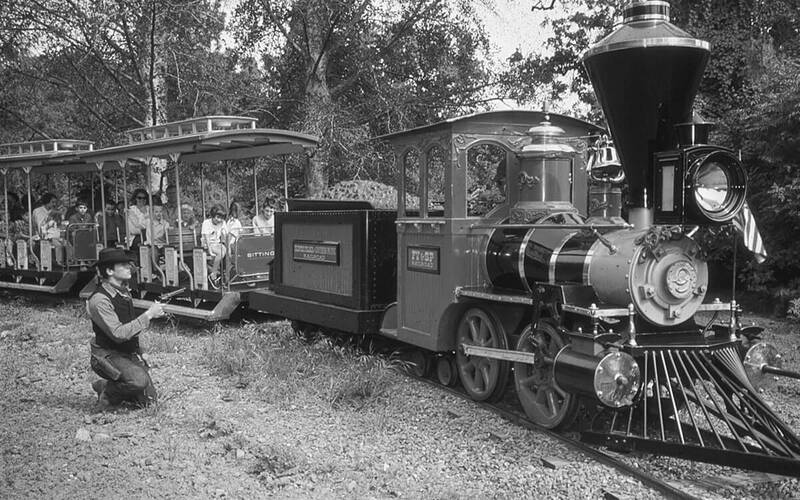 Attractions at the park included a 1920s Herschell Merry-Go-Round, Arrow Development scaled-down locomotive and train (currently in operation at Burke Junction in Cameron Park, Calif.), stagecoach ride, Rainbow Falls Fishing Pond and the Lost Frontier Mine. Designed by Laurie Hollins, the Lost Frontier Mine used ore cart conveyance vehicles supplied by Arrow Development. Guests were transported into an underground wonderland filled with waterfalls, bubbling sulfur pools, glowing stalactites, falling boulders and other special effects augmented with eerie sounds. 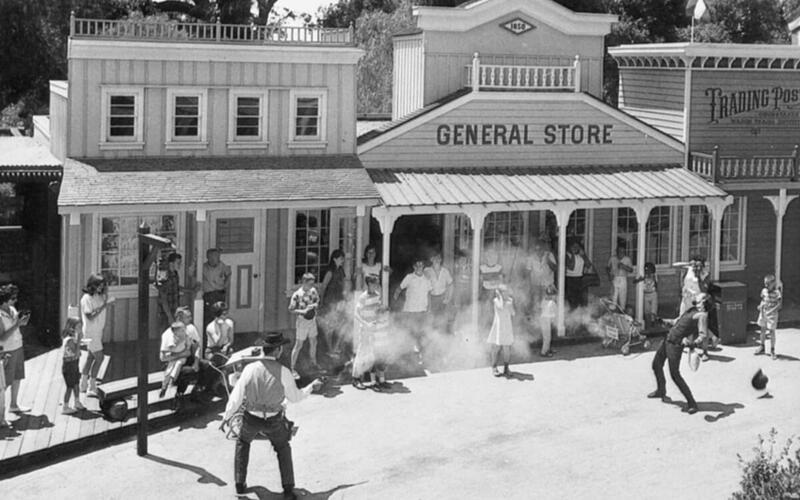 In keeping with the Wild West theme, gunfights and train holdups were a common occurrence, and the bad guys could cause trouble wherever they wanted, often robbing the General Store and even the Sweet Shop. The marshal, however, always prevailed. Over the years the park thrived, installing new attractions almost yearly. Among the rides added were an Eli Bridge Big Eli Wheel and Scrambler, Hrubetz Roundup, Sellner Tilt-A-Whirl, Eyerly Spider, Arrow guide-limited antique car and 1960s autos, Bisch-Rocco Flying Scooters and a Mack Rides Blauer Enzian. As the park thrived, so did the surrounding area, and by the mid-1970s the park was surrounded by urban sprawl. Homeowners started complaining about noise from the park and asked if smaller charges could be used during the park’s gunfights. In 1973 Zukin sold the park to Rio Grande Industries, a division of the Rio Grande Railroad. Rio Grande had purchased Arrow Development the year before and had plans to manage several theme parks, in addition to owning a ride manufacturer. In 1976 Marriott opened the Great America theme park just 15 miles north in the city of Santa Clara. Frontier Village saw a 19 percent drop in attendance the first year, but in the years following, attendance slowly recovered. Frontier Village continued to show a profit but Rio Grande Industries felt that in order to remain competitive the park would need to expand. An elaborate $10 million expansion plan was proposed but was, of course, met with opposition from the neighborhoods that had encroached upon the park. After years of delays, the city eventually approved the plans with the stipulation that Rio Grande spend an additional $1.8 million on traffic improvements and noise abatement. By that time Rio Grande had decided that Frontier Village was no longer a good investment and felt the land was too valuable to be used as an amusement park. Rio Grande gave park patrons one last season to say goodbye. Known as the “Last Round-Up,” the season was a busy one averaging 30,000 guests each day. On September 28, 1980, after 19 years of operation, the park closed its gates for good. Frontier Village was popular from the beginning, averaging between 425,000 to 450,000 guests at its peak. 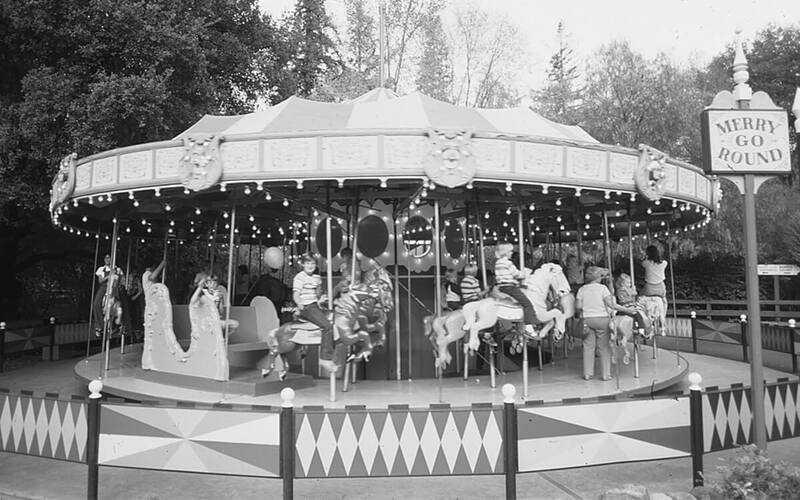 The park has a special place in the hearts of many people in Northern California and the surrounding area who had the opportunity to visit The Village in its heyday. Author Bob Johnson, who recently published an Arcadia Postcard series book on San Jose, has assembled an amazing collection of images from the San Jose Public Library, San Jose University, and private collectors — enough to fill the 128-page book. It offers a remarkable look at the fantasy frontier town where gunfights always ended with bad guys being carted off to Boot Hill. 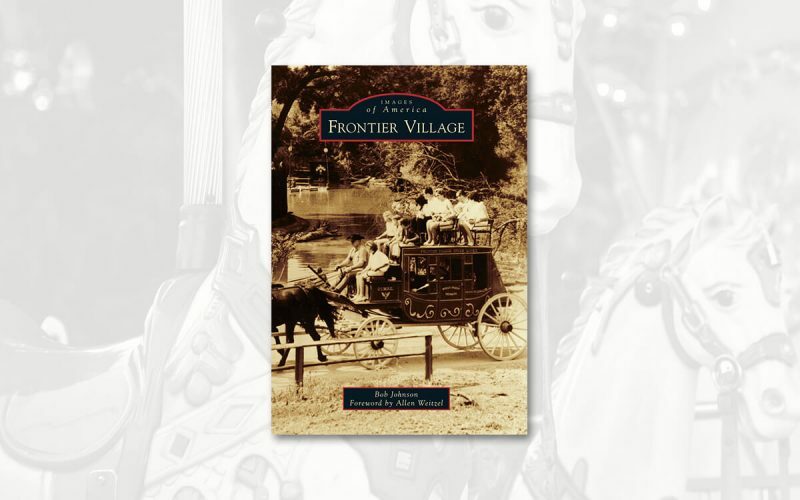 Images of America Frontier Village retails for $21.99 and is available at local bookstores, online retailers or through Arcadia Publishing at arcadiapublishing.com or by calling (888) 313-2665. This article first appeared in the September 2013, issue of Amusement Today, and is reprinted here courtesy of Amusement Today. For subscription information, visit AmusementToday.com.